Primavera P6 is one of the leading planning tools used by enterprise organisations, and as with every activity, the only way to be good at it is to practice. Whilst Primavera P6 PPM and other tools are easy to install, EPPM unfortunately, can be difficult to install. This blog aims to get anybody up and running with an EPPM environment of their own. So let's get straight into the usual disclaimer! The steps provided in this blog are provided with no support and Wraith Solutions accept no responsibility for any issues caused by following the instructions. It will not provide a production ready or secure environment, nor can we guarantee you sit within the licensing. In order to build a production ready environment, contact us, or another vendor, and if you are unsure whether you need licensing, contact a Primavera P6 sales representation. Oracle generally provide their software for free, providing it is only used for training and development purposes. Now the boring part is out of the way, let's begin! How will the blogs be laid out? This blog will be split up into three parts. This first part will cover the build of the Operating Environment that the software will sit on, the second will be the install of the relevant P6 components required for EPPM and the third will configure P6 so that you can use it. The server we are about to build will be install as a Virtual Machine installed on your desktop. This means it will share resources on your desktop and run side by side (in a window). This also means that you will need a powerful machine for this to work efficiently. 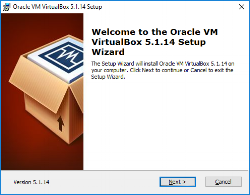 Oracle VirtualBox - Downloadable from https://www.virtualbox.org/wiki/Downloads. Look for the most recent binary for the operating system you are running, which should be at the top of the page, which on the date of this post was 5.1.14. Centos - Downloadable from https://www.centos.org/download/. I have used the "Everything ISO", however the "DVD ISO" should work for the purposes of this installation. These will take some time to download, so I would suggest starting them off and getting a brew or two. VirtualBox will download far sooner than Centos and so you can follow these steps whilst waiting on Centos. 2. On the welcome page click "Next"
3. On the custom setup page accept the defaults and click "Next"
4. On the next page click "Next"
5. You will now receive a warning notifying you that you will lose network connectivity for a short while. If this is acceptable, click "Yes"
6. Finally click "Install". If you receive a pop up at this stage allow it to continue to install. 7. You may receive a security notification asking you to install device software. If it is like the screenshot provided click "Install" and "Finish" once it completed. After completing the above steps to install VirtualBox you should be presented with the software automatically. If not, find it in your start menu and launch it to be present with the screen below. The following steps will take you through creating an empty Virtual Machine. 2. In the "Create Virtual Machine" window enter the details below and click "Next"
3. In the "Create Virtual Machine" window enter the memory size as 4096MB and click "Next"
4. In the "Hard disk" window ensure "Create a virtual hard disk now" is selected and click "Create"
5. For the Hard disk file type, leave the selection as default and click "Next"
6. Set the hard disk to be "Dynamically allocated" and click "Next"
7. Set the location of the hard drive file by clicking on the icon to the right of the name and navigating to the location you wish it to be, set the size to 30.00GB and click "Create"
8. The window will now return to the main application page with the new Virtual Machine listed as powered off in the left hand window pane. Now that we have a blank Virtual Machine to work with, the next steps will install an Operating Environment for you to work with. At this point your download of Centos should have completed, if not, take a break and come back when it has been completed. Ensure you have VirtualBox open on the home page and you can see your newly created server listed. 1. With the server highlighted click "Settings" in the menu bar. 2. 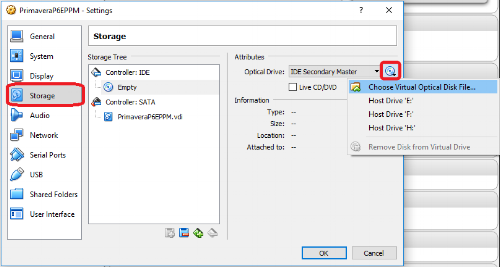 Select the "Storage" tab and set the Optical Drive to "Choose Virtual Optical Disk File..." using the highlighted icon. In the pop up, navigate to the location you download the Centos ISO file and click "Open" and click "OK"
4. If on boot it begins to do a check you can either wait (it takes a long time) or press "Esc" with the screen selected to abort the check. 5. On the initial welcome screen select and appropriate language and click "Continue". 6. On the Installation Summary page, select "Software Selection" and then select the "Server with GUI" option from the "Base Environment" list, click "Done"
7. On the Installation Summary page, select "Installation Destination" and then "Done" to confirm Automatic partitioning. Click "Begin Installation". 8. While Linux installs click "Root Password" to set a password for you to log on, clicking "Done" in the top left corner when you have typed in your password. You may have to click "Done" twice if you have not set a secure enough password. For the purposes of this guide, you do not need to set up a secondary user account. 9. Once the install has been completed, click "Reboot". 10. On the "Initial Setup" page click on "License Information". Read through the agreement and if you are happy, check the box at the bottom and click "Done". 11. On the "Initial Setup" page click on "Network & Host Name". On the network page click the on/off slider button to the right of the Ethernet connection and click "Done"
1. The next step is to log into your server and perform system updates. On first boot you will be presented with a Welcome page. Ensure the correct language is selected and click "Next". Do the same for the "Typing page". 2. On the Time Zone page, select your time zone and click "Next". 3. Click "Skip" on the Online Accounts page. 4. On the "About You" page, enter a Full name and username that you wish to use and click "Next"
5. Enter a password and confirm and then click "Next". Click "Begin using CentOS" to continue into your operating environment. 6. In the top right hand corner click on the inverted triangle, followed by the On/Off icon and "Restart". When reboot has completed, log back into the server. 7. Under the "Applications" menu, highlight favorites and click "Terminal". 8. In the Terminal window enter "sudo yum update" and reenter the password set for the account. When asked "Is this ok [y/d/N]" enter 'y' and press "Enter". If this fails with an error of "No more mirrors to try" ensure that your Network interface is turned on under Applications->System Tools->Settings->Network. To ensure this persists between reboots click the Settings icon in the bottom right and select the "Identity" tab. Ensure the "Connect automatically" box is checked. Primavera P6 EPPM - Available from http://edelivery.oracle.com. You will need to register for an account if you don't have one, but don't worry it's free and easy. You can then perform a search for Primavera P6 EPPM, ensuring you select the Linux x64 version.